This article looks at an alternative cash flow method, often called the indirect cash flow method. You'll learn how to use it, and why it's important. As with a lot of projections and financial analyses, there is more than one correct way to handle cash flow. That’s true with financial statements, which offer financial history in well-defined terms, and it’s also true with projections, which go along with business planning. This article looks at an alternative cash flow method, often called the indirect cash flow method, which projects cash flow by starting with net income and adding back depreciation and other noncash expenses, then accounting for the changes in assets and liabilities that aren’t recorded in the income statement. This method is also called the sources and uses statement, or a sources and uses projection. The indirect method starts with net income and then adjusts for all the sources and uses of cash that aren’t part of the income calculation. Results should be the same for either direct or indirect. It’s important to be aware of both common methods because, unfortunately, some people who ought to know better don’t. People will look at one or the other and think that it’s wrong if it doesn’t match the method they know. It isn’t—at least not necessarily. Notice also that the example here doesn’t match the standard one-column sources and uses statement you may have seen with accounting statements, because some concepts are sources in some months and uses in other months. For example, in the row for inventory, the negative number shown in January is negative because buying inventory absorbed cash in that month. Then it’s positive from February through May, because in these months more inventory was sold, as cost of goods sold, than was purchased. It goes negative in June because in that month, again, more cash was used to buy inventory than the amount of inventory that was sold that month as cost of sales. In a lot of accounting sources and uses statements, laid out as single column, rows divide into either sources or uses, but not both. The most important takeaway from this article is that there is more than one valid way to calculate projected cash flow. 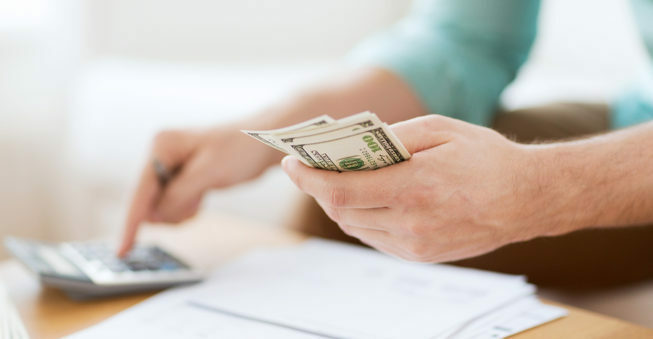 You, as a business owner, need to know that there are different ways to calculate cash flow—so you don’t get put off when somebody uses the other way. As your company grows, your planning grows. As you grow, if you add people to your team, then you want to bring them into the process, and make sure you're on the same page. You bring in skills. The business gets more complex as it grows. Cash flow gets more sophisticated. You start to manage the money and administration differently. Or you have a business plan event. You want or need to present a complete formal business plan, or the elevator speech, or the pitch presentation, or summary memo. That's what this section is about. Grow it and dress it as needed. Financial Forecast By the time you have the basic numbers in your evolving plan, it's not too hard to fill in some blanks and follow some standards to create a complete financial forecast. That's the projected income (profit and loss), balance sheet, cash flow, business ratios, the whole thing. It will make you look good and feel good to have a complete financial forecast. Supporting Information This is about the classic market analysis, industry analysis, and business descriptions: your management team, company history, and so on. Earlier I said this should be separate from your plan until you're going to use it. This is about how to do it when you need it. Dress It As Needed This is about the output. Having a plan, how to create an elevator speech, a pitch presentation, a summary memo, and of course the full formal business plan document. There are some good reasons that you might need formal financial projections. The best reason is planning cash flow better. I wrote about the cash flow traps in the previous chapter; being aware of them is better than not, but with standard financial projections, you can take your sales forecast, expense budgets, and starting position and with a few reasonable assumptions you can project your cash. That, however, takes standard financial projections. The cash flow is like the link between your income and your balances. See the illustration above. You may run into the acronym GAAP, which stands for Generally Accepted Accounting Principles. Everything in this section is according to GAAP. If you've done the basic numbers, you're already more than half the way there. You've already estimated your future sales, cost of sales, and operating expenses. You're very close to a standard pro forma income statement. Just add projections for interest and taxes, and you have that done. From there you want to project your balances. What will happen with capital, assets, and liabilities? If you can set your starting balances to match your beginning-of-the-plan estimated guesses, then some rolling assumptions will take you right from there to cash. In fact, my favorite way to make these estimates is to change and manage numbers in the cash flow and use those changes to automatically generate the balance sheet. I'll show you how to do that in detail in this section. An income statement (also called profit and loss) shows your business performance over a defined period of time (usually a month or a year). This is sales less costs less expenses, which equals profits. A balance sheet, on the other hand, shows your financial position at some moment (usually at the end of the month or the end of the year). This is assets, liabilities, and capital. Assets must always be equal to capital (also called equity) and liabilities.The cash flow reconciles the other two. Not all your money received nor all your spending show up in the Income Statement, and not all of it shows up in the Balance Sheet. The cash flow links the two. And, much more important, shows where the money comes from and where it goes. In the meantime, though, there are some standard conventions for the way these various statements link together. This is true in GAAP, true in Excel, in Lotus 1-2-3 if you do it right, and automatically in Business Plan Pro. Your sales forecast should show sales and cost of sales. The same numbers in the sales forecast are the ones you use in the profit and loss statement. As with sales, you should normally have a separate personnel table, but the numbers showing in that table should be the same numbers that show up for personnel costs in your profit and loss table. 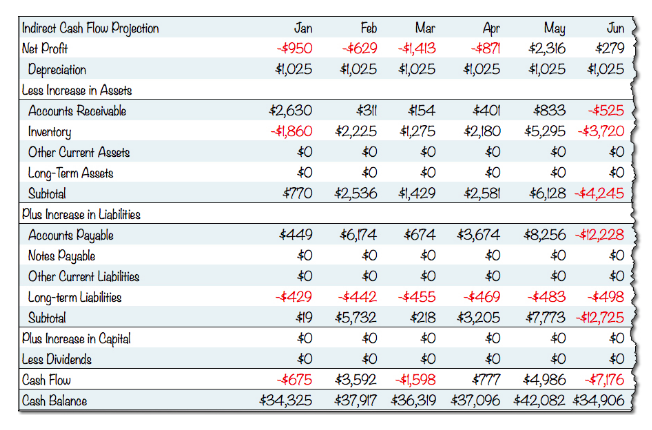 Your profit and loss table should show the same numbers as sales and personnel plan tables in the proper areas. It should also show interest expenses as a logical reflection of interest rates and balances of debt. Your cash flow has to reflect your profit and loss, plus changes in balance sheet items and noncash expenses such as depreciation, which are on the profit and loss. The changes in the balance sheet are critical. For example, when you borrow money, it doesn't affect the profit or loss (except for interest expenses later on), but it makes a huge difference to your checking account balance. The balance sheet has to reflect the profit and loss and the cash flow. Your business ratios should calculate automatically, based on the numbers in sales, profit and loss, personnel, cash flow, and balance sheet. Normal people hate financial projections because of their off-putting formats and buzzwords. Really, it's just a matter of making good estimated guesses about what you're going to be selling, what it'll cost and what your expenses will be. Let's go over a few simple points that generate a lot of unnecessary errors in business plans. These are simple facts—accounting conventions, in some cases—that answer a lot of entrepreneurs' frequently asked questions. Don't let your business plan look bad because of easy-to-fix errors. Before I start, take a breath. Don't glaze over when you see financial terms. They aren't that hard, and they are that important. Stick with me. For example, your fiscal year might go from February through January, or October through September. Use "FY" (as in "FY07") to specify the year in your plan. The year is always the calendar year in which a plan ends, not the year it starts. When your business sells anything to another business, you usually have to deliver an invoice and wait to get paid. That's called sales on credit, which has nothing to do with credit cards, but plenty to do with B2B sales. When you make the sale and deliver the invoice, the invoice amount increases sales and accounts receivable. When that money gets paid, it decreases accounts receivable and increases cash. Costs are normally the cost of sales, sometimes called cost of goods sold and direct costs. Costs are the money you spend on whatever you're selling, like what a bookstore pays to buy books. Expenses are regular running expenses like rent and payroll—expenses you'd have whether or not you had any sales. If you're getting venture capital, you'll know it. If not, just call it investment. New entrepreneurs think their companies look better if they have a lot of assets. One common example is wanting to take money spent on programmers and pretend that paying a programmer is buying an asset. Take my word for it: You don't really want that. It's better to expense those development expenses. That lowers your tax bill and makes your balance sheet look better, because you don't have fake assets. It seems counterintuitive, but cash basis isn't as good for predicting cash. The difference is timing. In accrual, the sale happens when you deliver the goods or perform the service. In cash basis, the sale happens when you get the money. In accrual, you owe the money when you receive the good or service, regardless of when you pay. In cash basis, you don't show what you owe until you pay it. I strongly recommend accrual because it's much more realistic. Real businesses don't pay upfront; they pay later. It's one of those potentially daunting buzzwords that really isn't that complicated. The pro forma income statement, for example, is the same as the projected profit and loss or the profit and loss forecast. Adapted from an Entrepreneur.com column, May 2007. Projections: How Many Months? How Many Years? For any normal planning purposes, for any normal company, you should have at least 12 months detailed month by month for business plan forecasts. That would be for sales forecast, cost of sales, your burn rate, and eventually the complete financial forecast, if you're going to do it. Then have another two years beyond that, for three years total, as annual projections. That doesn't mean you don't think in longer terms. Think about what you want for your business for 5, 10, 20 years. I'm all in favor of that. But I don't think you should plan in the detail of financial forecasts, for very long time periods. The larger numbers -- sales, for example, involve so much uncertainty that you don't get your time's worth back by trying to project more detail. At least not in normal cases. If you're farming lumber from tree farms, maybe. Be forewarned. You'll run into experts who will say you need more than 24 months by month, or more than five years in detail. They will be very sure of themselves. Sometimes what they mean when they say that is that they know more than you do, so they want you to suffer more. Or they want you to pay them to do the financials instead. Or they don't like you or your business plan and they're embarrassed to tell you that. So instead, they say you need to forecast in more detail. If they are investors, what they mean is that they don't want to invest and they don't want to tell you why. If they are loan managers, they don't want to make the loan. And they don't want to tell you the real reason. My advice to you, when that comes up, is that unless you are a special case (if you are, you know who you are), look for another expert. I've taken you this far with just the basic business numbers. To be fair, that's far enough. It certainly gives you some numbers to get a hold on and to manage, review, correct, and revise. It's likely that at some point you'll want to go further, into the straight financial projections that are part of a complete formal business plan. The good news is that with what we did with the basic numbers, you're already a long way there. The bad news is that here again the details and specific meanings of financial terms matter. You can't just guess. So I warned you earlier about the importance of timing with sales, costs, and expenses. This is very true with standard financials. Also, it starts to matter what goes where. It can be confusing and annoying. For example, interest expense goes into the income statement but principal repayment goes into the cash flow, which then affects the balance, but never appears anywhere in income. That means a standard debt payment that includes both interest and principal repayment has to be divided up into both parts. Interest is an expense on the profit and loss. Debt payment reduces debt on the balance sheet. Elsewhere in this book I discuss the huge difference between planning and accounting. With the three main financial statements, specifically, financial analysts use the term pro forma to describe projected statements and predictions. An income statement, for example, is about past results. A pro forma income statement is a projected income statement. The income statement is also called profit and loss. People often refer to the bottom line as profits, the bottom line of the income statement. It has a very standard form. It shows sales first, then cost of sales (or COGS, or cost of goods sold, or direct costs, which is essentially the same thing). Then it subtracts costs from sales to calculate gross margin (which is defined as sales less cost of sales). Then it shows operating expenses, usually (but not always) subtracting operating expenses from gross margin to show EBIT (earnings before interest and taxes). Then it subtracts interest and taxes to show profit. Notice that the income statement involves only four of the seven fundamental financial terms. While an income statement will have some influence on assets, liabilities, and capital, it includes only sales, costs, expenses, and profit. Some say income statement, some say profit & loss, or profit or loss. That's the same thing. Accountants and financial analysts use those titles interchangeably. I use income and income statement, but you can read profit & loss if you like. The income statement is about the flow of transactions over some specified period of time, like a month, a quarter, a year, or several years. If you've done the basic numbers I recommended in the previous chapter -- sales and cost of sales in the sales forecast, and expenses (including payroll) -- then you've got the bulk of the income statement done. Take the sales and cost of sales from that table, and the expenses from that table, and If you have interest expenses, and taxes, add them in. And that's about what it takes. The most important thing about a balance sheet is that it includes a lot of spending and money management that isn't included in the income statement. It's most of the reason that profits are not cash, and that cash flow isn't intuitive. It's all very much related to the cash traps. The balance sheet shows a business's financial position, which includes assets, liabilities, and capital, on a specified date. It will always show assets on the left side or on the top, with liabilities and capital on the right side or the bottom. Unless that simple equation is true, the balance sheet doesn't balance and the numbers are not right. You can use that to help make estimated guesses, and pull things together for projected cash flow. What's particularly important in planning is that neither the income statement alone nor the balance sheet alone is sufficient to plan and manage cash. I discuss the cash flow in much greater detail in the section Planning the Cash Flow. Startup costs, and startup funding. We've already talked about startup costs, but most business plans for startups also need to show where the money to pay for startup costs is coming from. That's a combination of investment and borrowed money. Your balances have to balance, and they don't balance without startup funding. Sometimes the startup funding will produce a useful business chart, a bar chart showing investment vs. borrowed money. Past Performance. When a plan is doing a complete financial forecast for an existing company, past performance is required to set the starting balances for the future. The last balance of the past is the first balance of the future. In practice, people often have to project a few months forward to estimate what the final balance will be on the day the new plan starts. For example, if you're doing a plan for next year starting in January, and it's only October, then you have to guess what happens to balances between October and December. Break-even analysis. A break-even analysis is a standard routine that compares sales to fixed and variable costs to determine how much sales will it take to cover costs. It can be an annoying analysis sometimes, because it requires averaging variable costs and unit prices over an entire business, but it can still be useful as a first look at the risks related to fixed and variable costs. Market analysis. The market analysis is usually an important core component of the market information, supporting information that is required when you're working on a plan for outsiders. Investors, bankers, professors of business, consultants, and others like to see proof of market. The market analysis table shows what data you have, usually a market growth projection, in general by segment. It's really a good idea to break the market into useful subsets, called segments. Market analysis can produce some good-looking charts too, like pie charts breaking the market into segments, and bar charts showing market growth as projected into the future. Ratios analysis. When you're projecting your income and balances, you can then use math and formulas to project standard business ratios. There are a couple dozen standard ratios that accountants and analysts often like to see. These are things like return on investment, profits to sales, inventory turnover, collection days, and so on. Use of funds. For plans intended to go to either investors or lenders, use of funds is a list showing how the money coming in will be spent. Use this to convince investors that you will put their money to good use. You should also use business charts, like bar charts and pie charts, to illustrate your projected numbers as much as possible. Graphics illustrate numbers very well. They are easier than numbers alone to see and understand. Fixed and Variable Costs and Burn Rate. As you consider your projected income statement, I hope you see three of your spending budgets there -- the cost of sales, the payroll, and the expenses. These also contain your fixed vs. variable costs, and your burn rate, which we went over in the Chapter 4. Those are good numbers to keep in mind. Why do fixed costs matter? They add to the risk. You have to pay them, whether you're making money or not. Some companies reduce risk by trying to make as much as possible into variable costs, depending on sales, instead of fixed costs. For example, to make programming expenses variable instead of fixed costs, contract the work by milestone, or pay less fixed compensation and more royalty on sales. The burn rate is the same thing. It's a sense of risk. If you know you need $10,000 every month to cover your burn rate, then when you watch your sales you have an instant sense of where they have to get.